This page gives an overview of some of the many projects completed recently. Palm-based collection and central recording of lawyer's time and expenses. 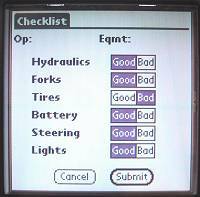 Handheld OSHA checklist solution for forklifts and all other mobile equipment. A wide variety of custom solutions — developed when you need them.